Shy Dog woman is cautious about the courtship of unfamiliar men, feels not quite comfortable in their society. Can not start a serious relationship with a person who does not trust. Therefore, a fan of the Dog must have patience, it will take a long time to achieve the reciprocity of this prudent person. 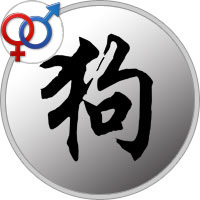 But a more loyal and loving partner can not be found: according to the Chinese horoscope, women of this sign are distinguished by exclusive fidelity. Intimate relationships — a delicate subject and even painful for a Dog female. She feels embarrassed, constrained by close communication with a man. However, it is able to deliver an unearthly pleasure to the lover, if there is complete mutual understanding between the partners. Is subject to doubts, experiences about their own sexuality, so the chosen one should be tactful and patient. But the relationship will last a very long time, if not all life: a Dog woman keeps loyalty to a beloved man until the end of her days. An intimate horoscope characterizes a Dog female as a restrained, shy partner. Her real emotions and feelings show only in a very close, trusting relationship. At the same time, an emotional, passionate woman can pleasantly surprise a partner, she just needs time to reveal her natural essence. Do not enter into intimacy for the sake of a pleasant pastime, she must really love a man, experience a crazy desire and passion for him. In bed, a woman-dog subtly feels the mood of a lover, it is important for her to please him, and thinks about her own desires in the last turn. It is so devoted to a partner that it completely dissolves in it. A woman in love erects her chosen one on a pedestal and faithfully serves him. Only a strong feeling is able to reveal her sexual potential, so she is grateful to her beloved man, does not consider it shameful to give in to him in everything. However, the lover should not forget about her natural shyness, do not expect the Dog to refined caresses. Most of all, the woman of this sign is afraid of betrayal, so she looks at her partner for a long time, trying to get to know him as best as possible. Inviting a Dog to bed is a sign of complete trust and boundless love. A man who has managed to win her heart can only enjoy his happiness. True Dog woman in bed is a little conservative, avoids bold experiments and perverted caresses. However, if you want, you can learn everything if you ask her well. Lover for her - authority, will not argue, but with pleasure submit. It is only a woman-Dog to fall in love with, or at least start to trust a man, as she throws all her tenderness at him. In her character, she completely surrenders to her partner, does not like to argue and swear, prefers to avoid sharp angles. Therefore, willingly responds to all the wishes of a lover, but even in the most passionate moments, she remains able to think soberly, always acts according to her principles. She likes the affection of her chosen one, but she will not accept a too obscene proposal for anything. In relations, the Dog does not pretend to be a leader, her path is a faithful assistant, a devoted companion of life. It is impossible to imagine her as a raging fury, an absolutely shameless woman. A Dog can be considered an ideal partner, ready for any sacrifice for the sake of love. She will not part with a man rather shy and unskillful in a romantic relationship. Rather, it will help him relax, achieve pleasure. With an experienced lover will be sensual and passionate, will try to match his temperament. Romantic nature Dogs crave ideal relationships, be for her a reliable and loyal partner, and better — a real fairy prince. Treat a Dog woman extremely delicately, with respect. Never deceive her, even a petty lie brings tremendous suffering to this vulnerable person. But even your exemplary behavior will not save you from rare, but unpleasant bouts of jealousy. A Dog female is afraid of losing her lover, try to be calm about the characteristics of her character. Do not expect to quickly gain the confidence of this cautious woman. The Dog will take a long time to look at you before deciding on a love relationship. Do not even try to behave impudently and untied, your bold affection will scare her away. A Dog female is capable of giving much, but only in response to a gentle attitude. You will become for her an indisputable authority, a mentor in bed, if you are a sincere and loving partner. Most Important: How to Seduce a Dog Woman? In a romantic relationship, a Dog female does not seek fireworks for emotions, it is more important for her to feel protected. Therefore, never pay attention to the impudent, unleashed young man, it is likely to interest a solid, calm man. You must be charming and very polite in dealing with her. No frivolous gestures and vulgar compliments. It is only a bad joke in her presence, as the Dog instantly pricked up, will start to look at you with a double attention. Do not forget about your manners only, but also about the appearance. She likes decently dressed men, and the informal style seems to her too bold and vulgar. A gentle, sentimental Dog woman will not stand before romantic courtship. Therefore, invite her to a walk in the picturesque park or arrange a boat ride. Endlessly talk about its beauty, compliments should be refined and refined. You can do without an expensive restaurant, an ice cream ball in an ordinary cafe will give her more pleasure than dinner in a stiff institution. By the way, it is not necessary to give only flowers, the woman of this sign is distinguished by kindness, responsiveness, so she will be glad to a lovely pet. Moreover, you will have the opportunity to visit her more often.